A length of 1/4-inch nylon cord that is almost twice as long as the flagpole is high. If your flagpole will be thirty-two feet high, sixty feet of cord will work well. When joining the ends of smooth, slippery rope, the Water Knot won’t fail. • Fuse the ends of the nylon cord. • String on the pulley and join the ends of the nylon cord with a water knot. • With an indelible marking pen, mark the middle of the cord. This middle mark will be be just about at the top of the flag pole. • Stretch out the cord and lay out the flag(s) the desired distance from the middle mark, and using small butterfly knots, tie a fixed loop at each grommet. • Attach a carabiner to each loop. When you’re ready to use the halyard, attach the pulley to the flagpole at the top with a prusik or a rolling hitch on a doubled rope. I also constructed this halyard using 1/2″ diameter rope (home depot rope) with Rolling Hitch on a bight (no pulley necessary) at the top. I used directional Figure 8 knots with a middle Butterfly knot to add a second flag (troop flag) under the American flag. It looked very impressive at the last camporee and held up to 40mph gusts!! The flag pole was the typical Scout Stave one in the OA video. On a couple of occaisions, I was sure the staves would break in two, but they held up. Two flags adds a lot more stress on the flag pole. Also, I might suggest the joining knot be between two flag loops. Yes. Good point! That’s why I like to mark the line with the indelible ink at the middle of the rope, so the Scouts know which way is up. But, knotting the rope between the fixed loops would provide foolproof assurance. Thanks! 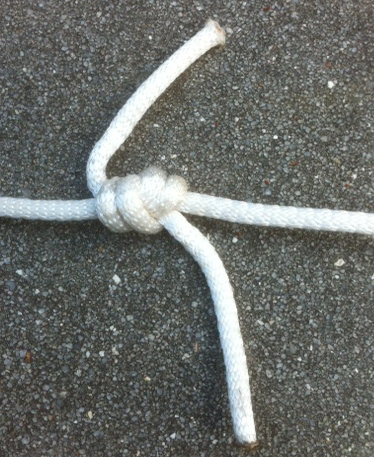 One recommendation, (from personal experience), is to put the joining knot near one of the butterfly knots. 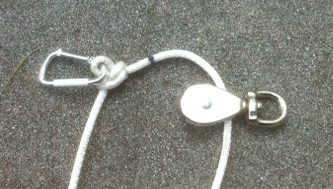 If the scouts inadvertently put it on “upside down”, the joining knot will jam in the pulley, but it won’t leave the flag halfway up the pole.